Online ticket sales have now ended. Tickets available at door. 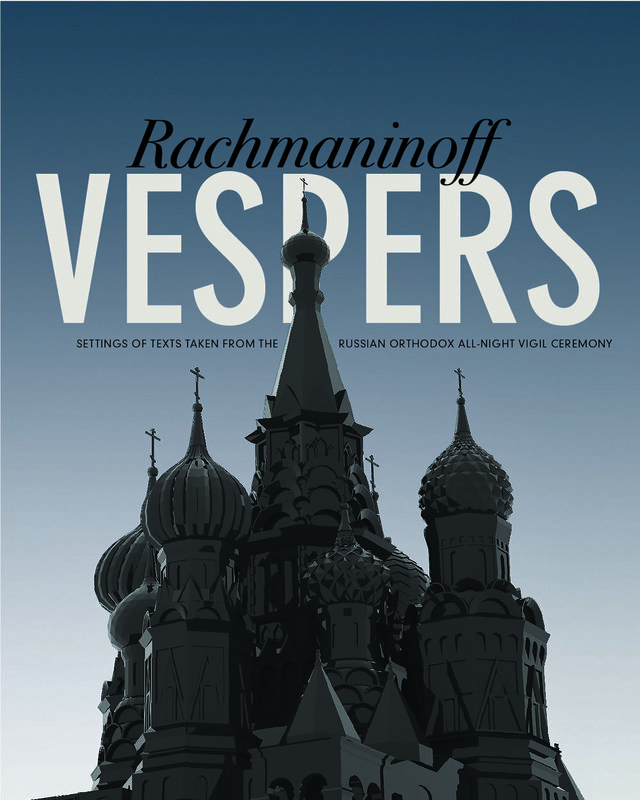 South Dakota’s own GRAMMY-nominated professional choir returns for the timeless Russian Orthodox masterwork, the Rachmaninoff Vespers. One of Rachmaninoff’s favorite works (he asked for some of it to be sung at his own funeral), his Vespers showcases a stunning array of techniques, merging centuries of traditional liturgical styles with Romantic and 20th-century compositional styles into one cohesive work. Across 15 movements, he takes the listener through multiple forms of ancient Orthodox chant, wonderful solo passages, and rich and complex harmonies up to 11 parts. Though it is commonly referred to as the Vespers, this liturgical work is more accurately an All-night Vigil and uses texts from the canonical hours of Vespers (evening), Matins (dawn), and the First Hour (Prime). In addition, it features infamously cavernous writing for the low basses, which caused the conductor of the work’s premiere to remark with skepticism, “Now where on Earth are we to find such basses? They are as rare as asparagus at Christmas!” Well, it turns out you can find them in January in Sioux Falls and Sioux City. Come join us for what promises to be a profoundly soul-stirring journey through one of the all-time greatest pillars of sacred music. Our previous installment of a historic masterwork was back in our second season, when we performed Maurice Durufle’s Requiem at First Congregational Church in Sioux Falls. That work for choir and organ was recorded as part of our very first album, In Paradisum, released in 2012 on the Gothic label and distributed internationally by Naxos Records.